There was originally a debate within the family as to whether to skip Copenhagen, but we all concur now that we’re really glad we went. Even our friendless children loved it, though they continued to remind us on an hourly basis while there that they were feeling kid-deprived. Still now, as I write this six cities later, it remains a favorite of the trip so far. Why? I think it was the bicycles. It’s a good sign when you arrive in a new city only to find that its airport is stunningly beautiful. It looked like a luxury shopping mall, with a gorgeous wood floors and high-end shops. Yup. This is why Denmark is known for design. For my artistic oldest, it was love at first sight. Even the airport is beautifully designed. Or are we at the mall? It’s also a good sign when your taxi driver doubles as a fascinating tour guide. By the time we arrived at our apartment, he had given us the big picture of the layout and a nice sense of what the city had to offer. Like other European cities, Copenhagen sports its fair share of stunning castles, palaces and monuments. We were greeted by our Airbnb host, a high school teacher, and one of his four kids. We would be staying in their family home while they wrapped up summer vacation nearby. The apartment wasn’t luxurious – in fact, some aspects of it were quite rustic. For example, you showered in the tiny bathroom by encasing yourself with a shower curtain across the bathroom door on one side and across the toilet on the other. But the apartment felt representative of local city life, was very roomy, had great character, and exuded warmth and happiness. You could literally feel that a loving family lived there, and it showed in our moods – we felt upbeat and content the whole time we were there. Even though it rained…a lot. The apartment location was superb – off the beaten path in a quiet ‘hood but within walking/biking distance of tourist sites and just feet from public transit. The best thing we did was rent bikes for a few days and use them as our primary transportation. 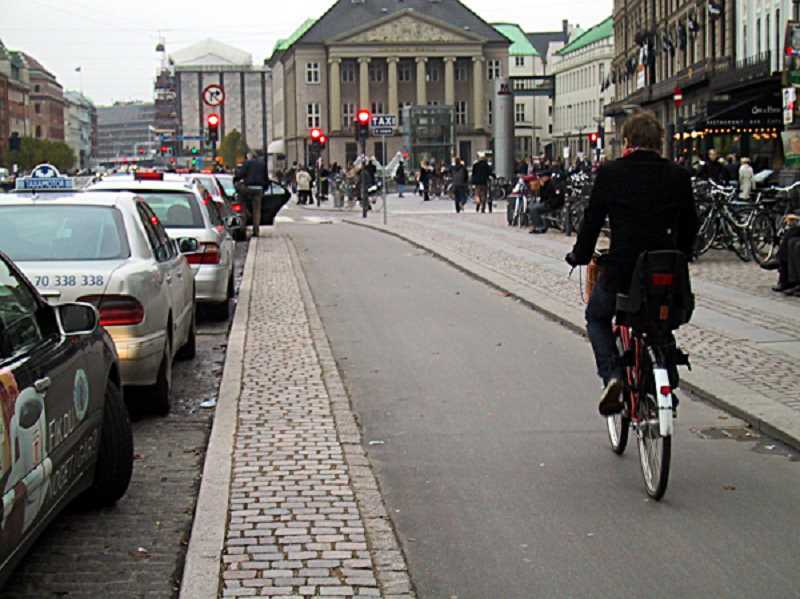 In case you didn’t know, Copenhagen is very flat, and there are bikes everywhere you look. Literally. They are so plentiful, many people don’t even bother to lock them up. It would be like locking up a piece of grass in a large field for fear it would be stolen. Copenhagen is such a bike-friendly city that bike lanes and bike traffic are fully-integrated into the traffic infrastructure. There is the street, a short curb, the bike lane, a short curb, and then the sidewalk. There are bike traffic lights wherever street traffic lights don’t suffice. And everyone follows bike etiquette – hand signals, walking the bike across a crosswalk rather than riding, giving way to pedestrians, etc. You can safely bike anywhere you need to go. In fact, we saw more parked bikes than parked cars. So we rode almost everywhere. And if we didn’t ride, we walked. We have a goal this year of 10,000 steps a day on average, and that was a piece of cake in soggy, gray-skied, marvelous Copenhagen. After a harried couple of weeks, we were ready for some downtime. Mornings were slow and mostly focused on school work for the kids. It was here that my husband and I were matter-of-factly informed by our students in no uncertain terms that we clearly don’t know how to teach kids their ages and we had better not give up our day jobs. Wow. Low blow. Still, we soldiered on. Picture the dynamic of frustratingly helping your also-frustrated kid with homework and then take it up several notches. Tons of fun. I can tell you now that homeschoolers also Fakebook it. Read their blogs. You’ll see. They make it sound so easy and ideal. Hmph! We did manage to work in plenty of afternoon sightseeing. One highlight was Tivoli Gardens, which opened in 1843 and is the second oldest operating amusement park in the world. It has great character. Among its offerings is a Moorish-inspired hotel and Hans Christian Andersen-themed attraction (not pictured) from which Walt Disney surely drew inspiration for his “Small World” ride. The park’s Cinderella ballet was so mesmerizing that we and a hundred other people sat through a soggy second-act downpour to see it through. Another day we took in a canal boat tour, which we highly recommend, as many of the city’s architectural wonders sit near the water. The bridges are so low in some cases that a tall person literally has to duck. Incredibly, this green power plant doubles as a ski slope in the winter! The pedestrian mall is a must-do, if only to watch the fabulous street performers, though there is also plenty of shopping available. Boutiques representing just about every fashion brand you can think of line the cobblestone walkway. There were an embarrassing number of American brands. We generally avoid retail therapy, but we did do some birthday shopping there with our oldest, who turned the big 1-3 on this leg of the trip. [Given the fact that all a thirteen year old girl wants on her birthday is to be surrounded by her friends, you can imagine how unimpressed our daughter was with a quiet home-cooked dinner with mom, dad, sister and only a moderately successful homemade apple pie, sans candle. She handled it with incredible grace, but nonetheless, we thought a shopping spree at the giant Addidas store to put a big grin on her face was the least we could do. On a few occasions, the girls begged off on sightseeing and stayed in while my husband and I explored. Their desire to nest at least one day for every 2-3 days of “boring” (or even “so-so” – “so-so” being the best reaction we can hope for) sightseeing has become a trend, and we’ve learned not to push them when they’ve had their fill of churches, castles and medieval ruins. But like the teaching of manners and the value of a dollar, we keep hoping our near-constant lectures on local history and cultural trivia are penetrating tiny cracks and crevices in their inner-beings and intellects, somehow, some way. Please, God. You know they’re desperate when they’d rather do pushups in the park than go to another museum or castle. My big regret is that we didn’t get to the the Designmuseum Danmark during our five days in Copenhagen, which I recommend for your own itinerary. We did go to the top of the Round Tower, the oldest functioning observatory in Europe, for 360-degree views from on high, where incredibly, we could see Sweden across the water and the stunning bridge that leads to it. Having endured an eight-hour wait in line for the car ferry from Copenhagen to Sweden many years ago, I can appreciate the convenience the bridge must offer today. During the last 48 hours here, as has become our modus operandi, we feverishly scrounged for last-minute plane tickets and Airbnb accommodations in Prague and were off for a new adventure on August 7. You have a wonderful way with words and pictures!